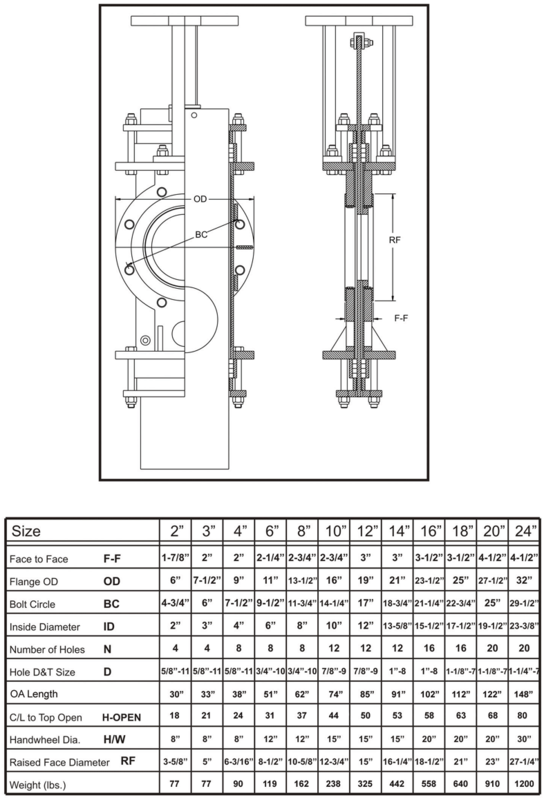 The Fabricast FIG 215 is a metal seated, uni-directional o-port slide gate valve. Designed and tested to MSS SP81 and ASME B16.5 specifications. For use in heavy solids flow media – hd stock, powders, hopper bottoms or anywhere a cutting action is required to close the valve. • Heavy duty fabricated and welded carbon- stainless steel body 2″ – 48″, packing gland, yoke, stemnut retainer and gate clevis. Sizes larger than 24″ are available in a fabricated and welded design. • 150 PSI CWP rated. • ASTM a 240 304 stainless steel o-port gate fully machined and surface ground. All edges are chamfered to extend packing life and to provide a superior atmospheric seal. • Braided teflon synthetic packing is standard. 3-11 PH rating. • Cast WCB steel handwheel (weldable). • Easily adapted to air cylinder, hydraulic cylinder, bevel gear, lever or electric motor operator (no welding required). • O-Ring seat – BUNA N 200 deg. F. EPDM 300 deg. F. HDPE / uhmwpe 200 deg. f, FKM/VITON – 400 deg F.
• Other Alloys – CS, 304, 310, 316, 317l, Duplex 2205, 2507, 904l, Hastelloy, titanium other – contact factory.